I saw this video last night and was touched deeply by it. Of course, I am a big Yanni fan. When Yanni shared who this song was written about, it was very touching. Felitsa is a song that Yanni created and dedicated to his mother, Felitsa Chryssomallis. You could see though in what he was sharing, just how special his mom was to him. In the video, he talked about her being present in his own heart as he shared the music. 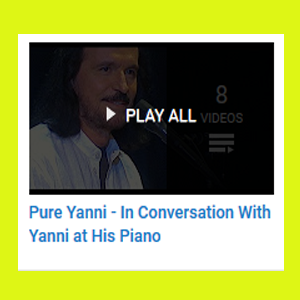 Yes, Yanni – I could readily see that in you. I hope you’ll take a moment and listen to what he had to say in this video because it was very touching. While I realize not everyone had a good mom and for some, Mother’s Day can be painful, it is refreshing to see the love between a mother and her son. Plus, I just love this song that Yanni created and maybe it touches me deeply since my own mom is no longer walking this earth. If you have a mom you love that still is around, make sure you let her know. Don’t wait until it is too late to tell her how much you love her and appreciate. If you’re a mom, just know that you do have great impact on the lives of your children, long after your time may exist on this earth. I created this website and the Relaxing Spa Music CD in memory of my own mom.